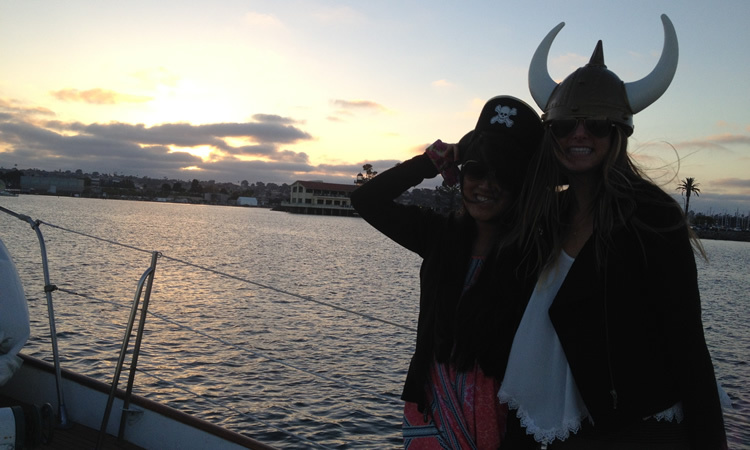 San Diego sunset at sea cruises. Times will change with the season…please call for specific times. Included: Sparkling wine, beer, soft drinks, water and light snacks. Have you ever actually sailed off into the sunset? From the days of great adventurers exploring the seas of the New World to the hectic modern world of today, for centuries we’ve been daydreaming of “sailing off into the sunset”. Have you ever actually done it? Make that daydream a reality and escape the busy lifestyle back on land by sailing with us on one of our sunset cruises right off into the sunset. It’s a commonly held notion that San Diego has some of the most beautiful sunsets on Earth. There is no more perfect way to experience one than by being out on the calm waters of the Pacific aboard a great sailing ship, standing on her bow watching the sun dip into the water and illuminate the sky with brilliant hues of yellow, orange, red, and purple against the fading deep blue sky. But let us not forget to mention the color green. Have you ever seen the color green in a sunset? Every sunset paints the sky with color in its own unique way. But every so often, the sun itself puts on a show that is truly awe inspiring. Usually lasting for only a few seconds just as the sun is about to disappear over the horizon, a stunning and breathtaking phenomenon sometimes occurs known as The Green Flash. Those fortunate enough to witness The Green Flash will see a strong dazzling green flash occurring at the top of the setting sun just as is about to dip below the horizon. The Green Flash only occurs under the proper atmospheric conditions which frequently occur off the waters of San Diego. Will tonight’s sunset be the one? Come join us on a sunset cruise and find out for yourself. 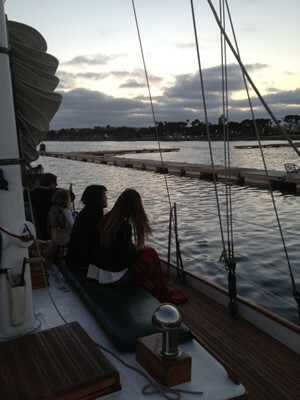 Aboard a beautiful wooden San Diego yacht, Jada passengers can relax at the end of the day on a sunset cruise. In addition to champagne cruises, Sail Jada Charters offer other types of private sailboat charters and public sailboat charters such as memorial at sea cruises, wedding at sea cruises and whale watching in San Diego. Call (858) 222-9479 to learn more today.